I am so excited for fall to start. Some of you may be under the mistaken idea that fall starts the day after Labor Day or maybe even not until the Autumnal Equinox. But to me, fall starts on September 1st. 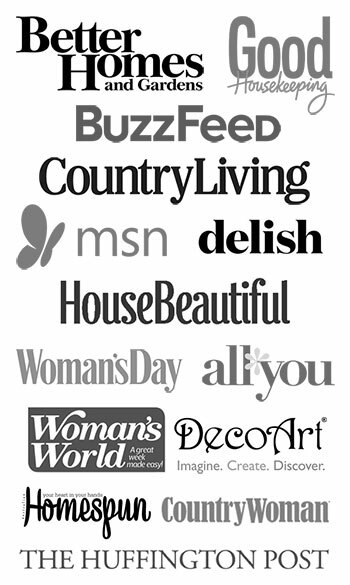 And this is my blog, so that is what I am sticking to. But before summer is officially over, I wanted to update you on a couple of strange occurrences that have been happening around here this summer. We have had a weird increase in the number of birds in our yard. We always had a lot, but it’s almost like a scene out of Alfred Hitchcock’s The Birds. Do you remember the birds attacking the kids in the schoolyard? Eeek! Unfortunately, none of these birds are of the Purple Martins variety that we thought we would have. Since we have a Purple Martin house and all. 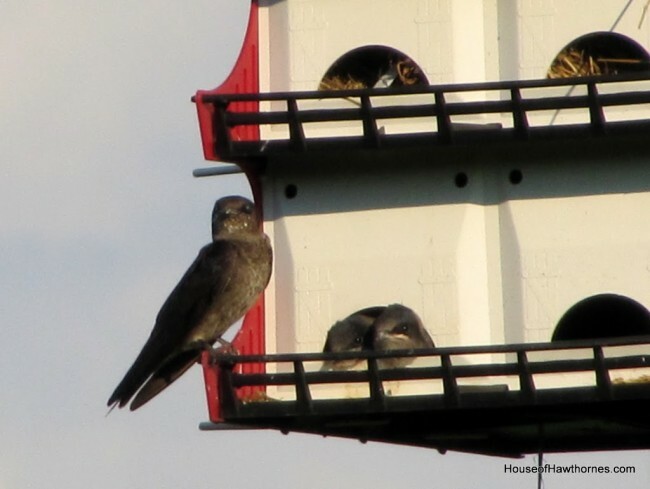 If you are a serious Purple Martin homeowner you are supposed to “relocate” the junkier birds so that the Purple Martins will move in. But honestly, once the junk birds build a nest and start laying eggs, I don’t have the heart to kick them to the curb. So another summer has gone by without my coveted Purple Martins. But Otis is enjoying the increase in birds no matter what variety they are. He thinks he’s hiding from them by blending into the mulch. In addition to the birds, a strange number of toads have set up housekeeping in our backyard also. Sheba has spent most of her summer staring at these guys. 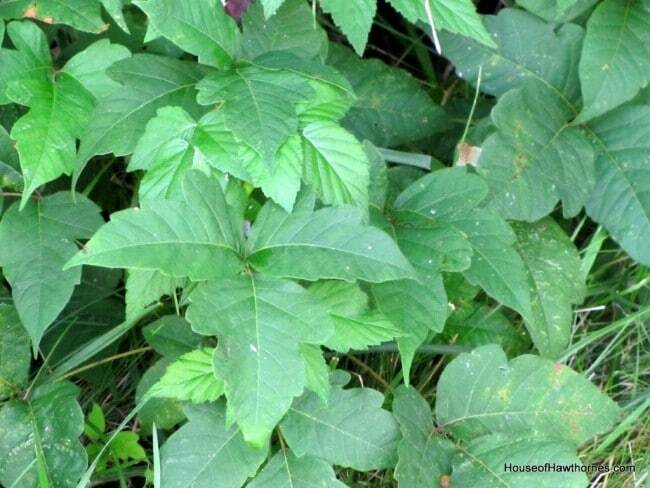 Besides birds and toads and whatnot, we have had a ton of poison ivy in the yard. I stay as far away from it as I can. And even then, I still have some spots on my ankle and arms. Me and poison ivy don’t mix well. And one of the weirdest occurrences is the soy beans. Weird because I don’t hate them this year. Go figure. The farmer that farms behind us alternates between corn (which I love) and soybeans (which in the past I did not appreciate). But for some reason, they decided to grow taller and they aren’t half as ugly as they have been in years past. Hardly any weeds too. OK, I think I have you up to date now on the mundane summer happenings in the yard. Sheba will keep an eye on things around here for you. 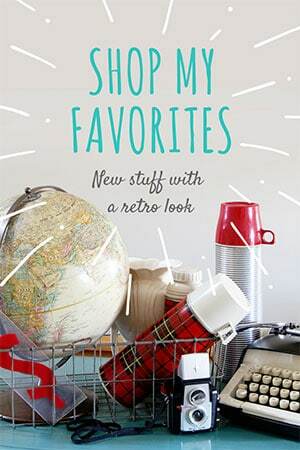 La over at A Musing Potpourri is having an End Of Summer Celebration today, so stop on over to see what everyone has been up to this summer. Send some of those over here! I’ve got a little guy with a toad obsession and none to be found. I would say you have a plenty too. Gorgeous shots. Well, that’s interesting. We have a lot of birds and toads this year too and our cats are having a hay day chasing everything that moves. 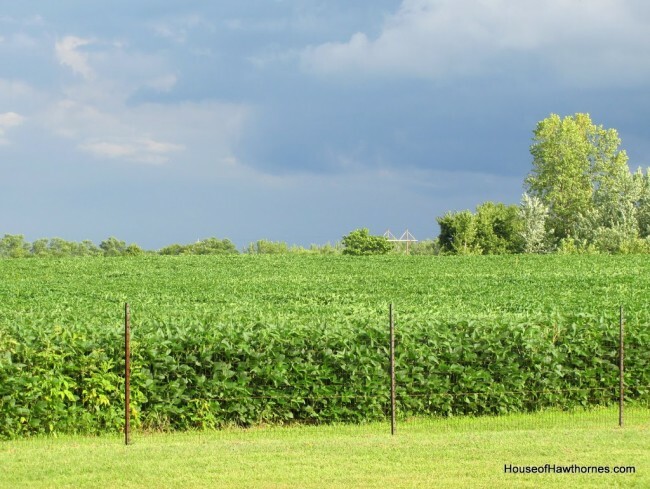 The soy beans at the end of the street are taller this year, too- but we have corn behind us this year. We do not have the poison ivy, thank goodness. Maybe the birds are pooping the seeds all over. 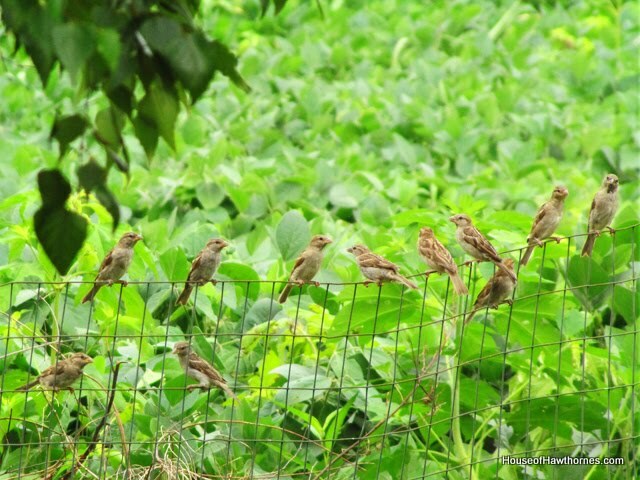 When my neighbors used to feed the birds they used thistle seed and we started getting them everywhere! So glad Otis has it all under control there. Good kitty! As long as you have Otis on duty, you should be ok! He looks to take his job of keeping you safe from the hoards of birds and toads very seriously! HOORAY for fall, can’t wait! Put all my summer stuff away yesterday! Now, just have to start getting out “fall”! We have really had the toads this year, too…and right now the Monarch butterflies are migrating through- so pretty! Lovely photos, Pam! Otis acts like he doesn’t know he is being photographed, but we know better. I love the way Sheba is trying to figure out what the heck is going on with that toad. I hate to break it to you, but once you have THAT birthday…you know then one…strange things start happening to your body too. I like your tree house. So cool for a non-farm girl to see the huge field of soybeans. I thought you were heading toward a biblical plague, with toads and birda and soybeans…sorry, too early, trying to be funny. SuzieQ – yes, you can try to attract them by putting a CD player out by the birdhouse and playing a CD of their bird calls. 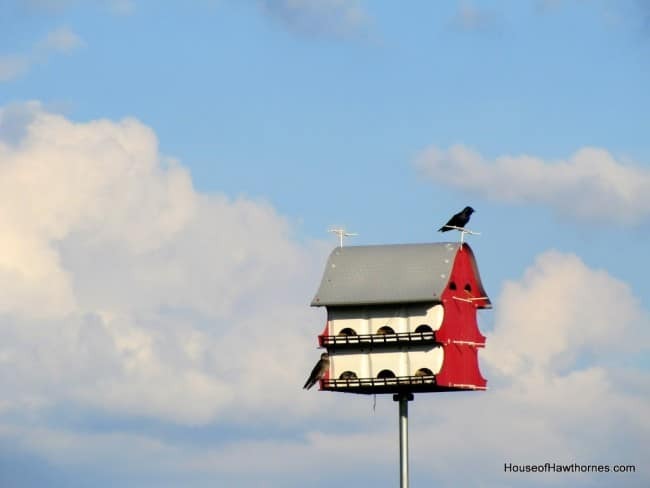 They also make little plastic Purple Martin birds that you can attach to the top of the house so that when other Purple Martins fly by they can see that it must be a good place to set up housekeeping. I haven’t gotten that serious about it yet. Maybe next year! Oh man, I’d hate to be known as the “junkier bird”. happy fall then! I agree and will be at 1515 this weekend and put my fall stuff out. The pictures are wonderful. Like the bird one, I am sure Sheba is happy! I love the photo of animal ears and the toad. 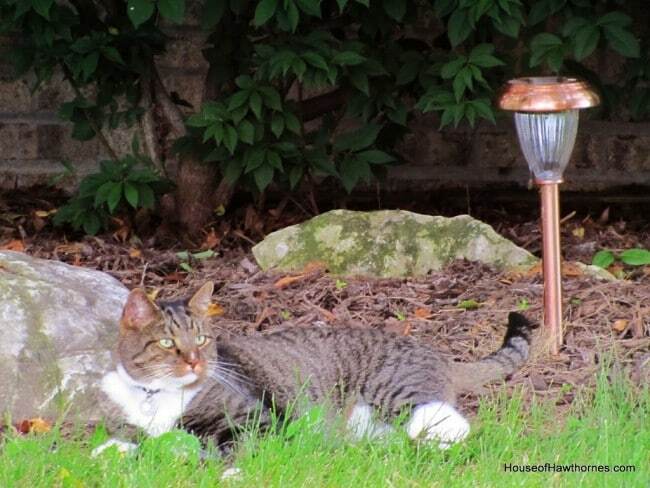 Does your cat take his paw and quick smack the toad to check out what it is? My cat used to do that and it was so funny. A Hoarder You??? No way. Me?? Maybe. Ha, Ha. I love all the birdie photos. In Fla. at Mom’s the birds were numerous also. 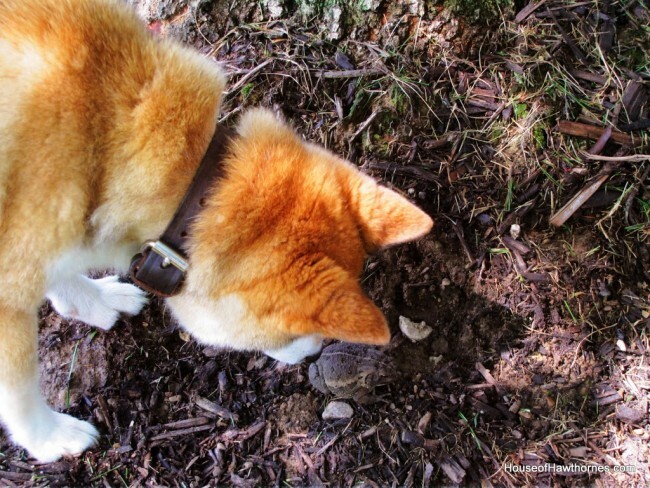 I love that photo of Sheba and the toad!!! Back home we had lots and PIlot was always barking at them…too funny! They would burl themselves in the lawn. We have tons of frogs and tree frogs again. Sept. 1st is officially fall for me too. I passed up the watermelon at the grocery store today! Pam, I just love how you took the photo over the cat’s ears! Otis must be loving the backyard! Such gorgeous pictures. I just made my husband come look at this post. In addition to gardening, he is quite the bird enthusiast. This post is just amazing. Toads are just so cute, to me they are. My kids spend all summer looking for them, finding and then building sand houses for them. Your furkids are beautiful! 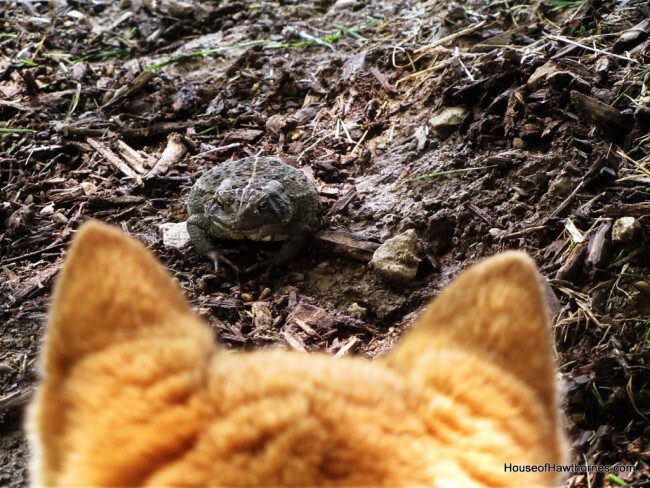 Love the pic of Sheba and the toad. Thanks for sharing!